Jim Dowd is the seventh-oldest player active in the NHL this season and is the fifth-oldest player to appear in a game for the Flyers. "The Oldest Flyer" hustled down the left wing, caught up to a chip pass from Riley Cote and rifled a slap shot past Ottawa Senators goaltender Ray Emery for the 70th goal of his NHL career. As he skated a long loop around the Wachovia Center ice, hands high in the air in celebration, Jim Dowd looked into the crowd and smiled. Even at 39, the Jersey kid inside Dowd still can remember being on the other side of the glass, dreaming of someday playing in … college? "Are you kiddin' me?" Dowd said when asked when he first had aspirations of playing in the NHL. "If I had listened to everybody, I would have never even played college hockey. I consider every day after high school a bonus." Now in his 16th NHL season, Dowd is playing a limited -- but crucial -- role as the Flyers' fourth-line center, proving that even a 39-year-old walk-on can make a difference in a drive to make the Stanley Cup Playoffs. "Jimmy's a quality guy, a real team guy," said Flyers coach John Stevens, who is just four years older than Dowd. "He seems to have composure all the time. He'll do whatever he has to do to help the team, whether he plays a lot or plays a little." Dowd's quiet but remarkable career is the reason he is the Flyers' nominee for this year's Bill Masterton Memorial Trophy, which is awarded annually to the NHL player who "best exemplifies the qualities of perseverance, sportsmanship and dedication to hockey." In 1968, Masterton became the only NHL player to die as the result of an on-ice injury, when his head hit the back of the ice after a three-player collision. He died two days later of a massive brain hemorrhage at the age of 29. Dowd, who is the seventh-oldest active player in the NHL and the fifth-oldest to wear a Flyers jersey, certainly is the picture of perseverance. Taken by the Devils in the eighth round of the 1987 NHL Entry Draft, Dowd has played for 10 NHL teams, four AHL teams, one IHL team and spent a year playing in Germany during the 2004-05 lockout. "I think when you grow up one of seven kids, you learn that life is all about hard work," Dowd said. "My parents never asked me when I came home from a game, 'How many hits did you get?' Or, 'How many goals did you score?' They asked me, 'Did you guys win?' My brothers, too. Did you win? Yes or no. That was it." As a kid growing up in Brick Township at the Jersey Shore, Dowd's first job was as a paper boy, delivering the Asbury Park Press and selling USA Today on the boardwalk. "Me and my buddy sold USA Today when it first came out and no one knew what it was," Dowd joked. "Nobody bought it." Dowd grew up a huge baseball and hockey fan and owns every World Hockey Association card ever made. He said his father, a retired salesman, treated him and his two brothers to one Rangers game every season, as long as they sat in the upper-level blue seats. When Dowd was 13, the Devils came to East Rutherford and he became an instant fan. "It was like, we finally got a team in New Jersey!" he said. "We had nothing. No baseball, no football. I mean, the Giants? C'mon, they're the New York Giants! We were all Rangers fans up that way. When the Devils came we had somebody to root for." Dowd said he and his high school buddies would buy the cheapest seats at the Meadowlands Arena and move down to the front row, "because there was nobody there." All the while, Dowd was making a name for himself at Brick Township High School, where he led the team to the New Jersey State Interscholastic Athletic Association title in 1986. Dowd set a national scholastic scoring record with 375 points in four years at Brick Memorial, earning himself a scholarship to Lake Superior State. "I didn't realize until I was playing college hockey against guys like (Rod) Brind'Amour, who were going to the NHL, that wow, I can hang with these guys," Dowd said. Dowd led Lake Superior to a national title and spent most of his first four years as a pro in the AHL. His career highlight came in Game 2 of the 1995 Stanley Cup Final, when he scored the game-winner for the Devils en route to a sweep over the Red Wings, becoming the first New Jersey native to win a Stanley Cup for the Devils. "It was like scoring a touchdown in the Super Bowl. Like hitting a home run in the World Series," he said. "And the best thing is that my youngest brother was in Detroit to see it." Since then Dowd has played in Vancouver, the New York Islanders, Calgary, Edmonton, Minnesota, Montreal, Chicago, Colorado and Philadelphia. "My wife (Lisa) and I talk about it all the time," he said. "I've played in great hockey cities. … I couldn't ask for anything better." Dowd defied the odds when he made the Flyers on a tryout contract in training camp. He passed through NHL waivers two months ago, and when the Flyers were unable to land free-agent center Peter Forsberg before Tuesday's trade deadline, Dowd was the happiest player in the team's dressing room. "I know I can help this team," Dowd said. "My whole career I've always played my best hockey at the end of the year, and I want to do it for this team. Let's face it, this is a kid's game and I'm still playing. You'll have to tear the jersey off me." Around the Atlantic -- The Penguins are hoping to get newly acquired right wing Marian Hossa (knee sprain) back by the end of this week. Meanwhile, Sidney Crosby (high ankle sprain) was considering joining his teammates on their upcoming three-game road trip to Tampa Bay, Florida and Washington. 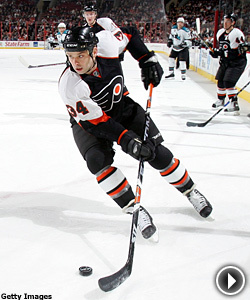 … Right wing Petr Sykora entered Sunday's game against Atlanta with 12 of his 20 goals coming on the power play. Among players with 20 or more goals, he is second in the NHL in percentage of power-play goals (60 percent). Montreal's Alex Kovalev leads the League, with 16 of his 25 coming on the man-advantage. … Islanders All-Star goalie Rick DiPietro is expected back Tuesday night when the Isles face the rival New York Rangers. DiPietro skipped Sunday's game against Florida to attend the funeral of his paternal grandmother, who passed away Feb. 28 in Massachusetts after years of suffering from Alzheimer's disease. "It just really puts things in perspective, and you realize how fragile life is," DiPietro said. "You just wish that you had a chance to spend more time with them." DiPietro had started 14 straight before Wade Dubielewicz stepped in Sunday against Florida. … Right wing Bill Guerin's goal against the Flyers Saturday made him the second player in NHL history to reach 20 in one season with six different teams; Ray Sheppard is the other. … Isles defenseman Brendan Witt returned to the lineup Saturday after missing eight games with a sprained knee. The Isles were 6-2 without Witt in the lineup. … The Devils might be the most productive unproductive team in the NHL this season. They have been held to one goal or fewer in 20 games this season, but were just a point back of the Penguins heading into Monday's action. … In back-to-back nights, the Devils lost to former Montreal goalie Cristobal Huet, now with Washington, and current Montreal goalie Carey Price. … Right wing Brian Gionta has five goals in the last 10 games after going 13 without a goal. … The Devils will try to sweep the season series against the Toronto Maple Leafs with games in Toronto Tuesday and Saturday, sandwiched around a home game against the Lightning on Friday. … Left wing Nigel Dawes became the second Rangers rookie to score 10 goals this season. Center Brandon Dubinsky reached double-digits earlier last month. The last two Rangers rookies to score 10 goals in the same season were Mike York (26) and Jan Hlavac (19) in 1999-2000. … Goalie Henrik Lundqvist's eighth shutout last week was the team's 10th, the most since Ed Giacomin had 10 in 1970-71. … The Flyers entered the week with points in five straight games (3-0-2). … With his two-goal game against the Rangers, center Jeff Carter now has four goals in four games after a five-game drought.